How to Score Concrete for a more realistic look. 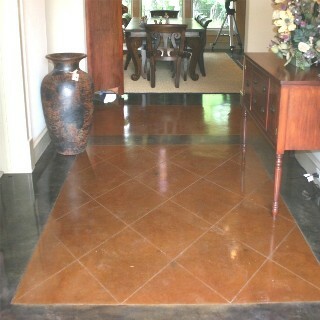 Scoring the concrete creates a more realistic pattern in your concrete. If you intend to score a pattern into the concrete, you should do so before final cleaning. Concrete Scoring is just that. A slight 1/16" deep or less score in the concrete to replicate a mortared joint. If you cut the concrete deeper, then it will only collect dirt. You can use a skill saw or a 4 1/2" angle grinder with a diamond blade, along with a straight edge. Set the saw blade if using a saw, to about 1/16"
Measure your lines out, mark each end with a pencil, and then mark the lines with a chalk line, using blue chalk. Never use red chalk as it stains the concrete. Use a straight edge of some sort ( 2 x 4 board, piece of angle iron, etc.) Holding the straight edge firmly and the proper distance from the line to ensure the diamond blade is on the line, score away. As your saw or grinder will not score completely to the wall, you will need to cut a border about 8" +/- around the walls and take your pattern scoring to the border lines. Tip. Using a 4 1/2" grinder to score the lines, is usually much faster and you can use a flat straight edge. Also, most slabs tend to have slight high and low areas and a skill saw can sometimes skip because of this, as where a grinder will follow the natural contour of the surface. Tip. Use a diamond blade, especially if using a skill saw. Unless you're looking for the wide mortar joint, then masonry blades are the ones. However, they get smaller as they go. Of course that doesn't matter when using an angle grinder but when using a skill saw they don't work so well. Tip. You can get flat and angle iron type straightedges that are made from aluminum, at Lowes. Tip. You can cut the lines deeper and mortar them in later, which looks very realistic. Just be sure to clean up the mortar mess as you go, once mortar dries, that's about it. To do this, just cut the concrete a little deeper, apply the stain, wash the residue, apply one coat of sealer, mortar the saw cuts in and clean the mortar mess, apply second coat of sealer, apply two coats of wax. Allow sufficient drying and cure times between steps. Tip. You could really use a helper or two for this step, someone to hold the chalk line and the straight edge. Tip. To keep the mortar joints the color of natural concrete, simply stain first and then score the concrete.